Orchestra members, soloists and opera singers throughout the world often recount how Jed Gaylin’s rehearsals and performances elicit their very best, not only individually but collectively. Mr. Gaylin revels in making connections—not only within a piece, but also between seemingly disparate and wide-ranging works—to sculpt a concert of surprising and captivating juxtapositions. His dedication to exploring the music’s fullest potential in a collaborative spirit reaches beyond the stage, drawing the audience into the creative act. Listeners feel far more than just welcomed by words from the podium; they feel engaged as participants in a wordless musical conversation that is spontaneous, big-hearted and eloquent. As music director, Jed Gaylin leads the Bay Atlantic Symphony, Hopkins Symphony Orchestra, and Two Rivers Chamber Orchestra with the same creative depth and an open spirit that he brings to the podium. The Bay Atlantic Symphony is not only consistently praised for its astonishing level of artistry and precision, but is also viewed throughout New Jersey as a model for how professional orchestras can become a vital focus and source of identity in their individual communities. As a sought-after creative partner throughout the region, the Bay Atlantic Symphony has forged residencies with three area colleges, numerous municipalities, music festivals, and even casinos. Atlantic City’s Borgata Hotel Casino & Spa hosts the Symphony for an all-classical summer series, which began in 2013. In 2012, Jed Gaylin was named “Artist in Residence” at The Richard Stockton University of New Jersey. This position is a part of an innovative model in which Bay Atlantic Symphony is integrated into the music curriculum. Symphonic rehearsals and presentations have become focal points for coursework and seminars. Also in 2012, Mr. Gaylin was named music director of the Two Rivers Chamber Orchestra, based in Shepherdstown, West Virginia. Mr. Gaylin makes his home in Baltimore, Maryland, where he lives with his wife—poet and essayist Lia Purpura—and their son. He has been music director of Hopkins Symphony since 1993, during which the orchestra has grown in size, prominence and artistry and has become one of the country’s most accomplished university orchestras. The high standards of the orchestra and Mr. Gaylin’s belief in art’s ability to stich together and ignite new energy in our communities have resulted in collaborations with arts groups throughout the city, as well as other non-profit and civic organizations. Also in Baltimore, Mr. Gaylin was a regular conductor of Opera Vivente, where his interpretations of Mozart, Verdi, Donizetti and Jonathan Dove have been consistently praised for their nuance and power. Early in his career, Jed Gaylin was awarded the prestigious Presser Music Award to conduct in Russia, and a National Endowment for the Arts award to conduct in Mexico. Since then he has forged close relationships with musicians from all over the world and relishes making music in different countries. He is consistently invited for return engagements, as audiences and orchestras are drawn to both his artistic and human qualities. Mr. Gaylin also served as Director of Orchestras of the Cervera International Music Festival and Summer Course (Spain). He has been Principal Guest Conductor of the National Film and Radio Philharmonic (Beijing, China) as well as Principal Guest Conductor of the Sibiu State Philharmonic (Romania). Mr. Gaylin has also led numerous orchestras, including the Saint Petersburg State Symphony, Shanghai Conservatory Orchestra, Xinjiang Philharmonic, Bucharest Radio Orchestra, Academia del Gran Teatre del Liceu (Barcelona, Spain), Eastman School of Music Broadband Ensemble, Lodz Philharmonic and Pomorska Philharmonic (Poland), Gnessin Institute Orchestra and Moscow Chamber Symphony (Russia), Orquesta Sinfonica de Guanajuato (Mexico), Orvieto Festival Orchestra (Italy), Naples Philharmonic (Florida), Symphony New Hampshire, and Wheeling Symphony (West Virginia). He has taught master classes and lectured throughout the world including at the Shanghai Conservatory, the Peabody Conservatory, and the Eastman School of Music. 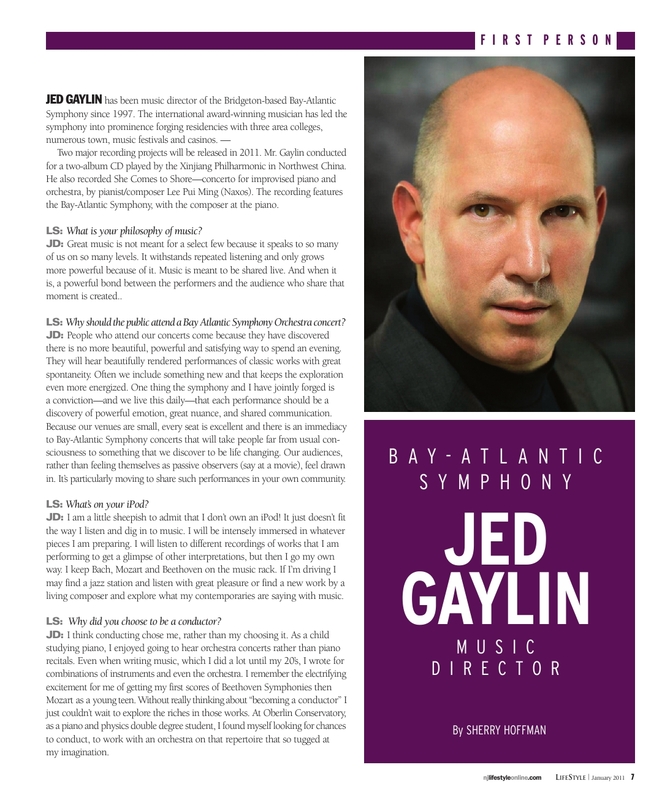 Soloists such as Hilary Hahn, Yuja Wang, Eugenia Zukerman, Shai Wosner and Stefan Jackiw have performed with Jed Gaylin leading the Bay-Atlantic and Hopkins symphonies. Composers he has commissioned include Carlos Sanchez-Gutierrez, Lee Pui Ming, James Grant, Russell Steinberg and James Lee. Mr. Gaylin has recorded She Comes to Shore— a concerto for improvised piano and orchestra, by pianist/composer Lee Pui Ming (Naxos/Innova). The recording features the Bay Atlantic Symphony, with the composer at the piano. He also conducted the Xinjiang Philharmonic in Northwest China for a double CD recording featuring composers and indigenous instruments from Xinjiang and Shanghai. Among Jed Gaylin’s television and radio broadcasts have been National Public Radio’s “Weekend Edition,” bringing the Bay Atlantic Symphony to more than four million listeners; Voice of America presentations throughout Europe and the former Soviet Union, as well as with the Bucharest Radio Orchestra and the National Radio and Film Philharmonic in Beijing. Mr. Gaylin and the Bay Atlantic Symphony were also featured in a full-length concert performed at the Cape May Music Festival, which was broadcast on WWFM in New Jersey and has been aired repeatedly on WYPR in Baltimore. Mr. Gaylin earned both a bachelor of music in piano and a master of music in conducting at the Oberlin Conservatory, as well as a Doctor of Musical Arts in conducting at the Peabody Conservatory. He attended the Aspen Music Festival as a Conducting Fellow. His conducting teachers have included Frederik Prausnitz, Leonard Slatkin, Jahja Ling, Murry Sidlin, Paul Vermel, Michel Singher, and, for piano, Lydia Frumkin. Jed Gaylin makes music with spirit, intellect, soul and rigor, as well as a deep knowledge of world cultures, human nature, and the arts. His approach to music, musicians, and life is rare: an Old-World commitment to study and depth of conception, combined with a welcoming presence and warm engagement—both on and off the podium. Visit jedgaylin.com to learn more. Click here for bio copy for programs and/or other publications.